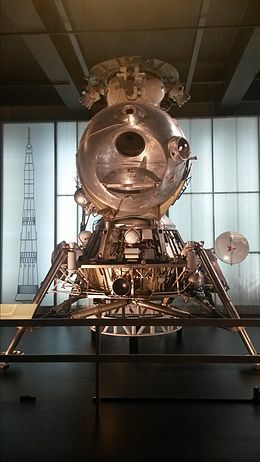 The LK (Russian: ЛК, from Russian: Лунный корабль, "Lunniy korabl", meaning "lunar craft"; GRAU index: 11F94) was a piloted lunar lander developed in the 1960s as a part of the Soviet attempts at human exploration of the Moon. Its role was analogous to the American Apollo Lunar Module (LM). Several LK modules were flown without crew in Earth orbit, but no LK ever reached the Moon. The development of the N1 launch vehicle required for the Moon flight suffered setbacks (including several launch failures), and the first Moon landings were achieved by US astronauts. As a result, both the N1 and the LK programs were cancelled without any further development. A drawing and a CGI image of the LVA during takeoff. Sergei Korolev, the lead Soviet rocket engineer and spacecraft designer during the 1950s and 1960s, planned to adopt the same lunar orbit rendezvous concept as seen in the Apollo Program. The lunar expedition spacecraft L3 consist of LOK Lunniy Orbitalny Korabl (Soyuz 7K-L3) Command Ship (a variant of the Soyuz) and LK Lander. L3 would carry a two-man crew atop a single three-stage superheavy N-1 booster. A fourth stage, the Blok G, would push the L3 (LOK+LK) toward the Moon, with the Blok D as a fifth stage. The Blok D engine would also slow the L3 into lunar orbit. Following the coast to the Moon, one cosmonaut would spacewalk from the LOK to the LK (Lunniy Korabl) lander and enter it. He would then separate the Blok D stage and the LK from the LOK before dropping toward the Moon using the Blok D engine. Once slowed from orbital velocity and placed on a trajectory to the vicinity of the landing site by the Blok D, the LK would separate from the Blok D and continue the descent and landing using it's Blok E stage on the LK for terminal deceleration and landing. An earlier unmanned probe of the Luna programme, a Lunokhod would be used to select a suitable area, and then act as a beacon for the LK. A backup LK would then be launched to the landing site. The third step would see a manned LK landing with a single cosmonaut. Although the specifics on planned activity while on the lunar surface remain vague, the small size and limited payload capacity of the N-1/Soyuz LOK/LK compared to the Saturn/Apollo meant that not much in the way of scientific experiments could have been performed. Most likely, the cosmonaut would plant the Soviet flag on the Moon, collect soil samples, take photographs, and deploy a few small scientific packages. Long duration missions, lunar rovers, and other activities performed on the late Apollo landings were not possible at all. After a day on the lunar surface the LK's engine would fire again, using its landing leg structure as a launch pad. To save weight, the engine used for landing would also blast the LK back to lunar orbit for an automated docking with the LOK, using the Kontakt docking system. The cosmonaut would then spacewalk back to the LOK carrying the Moon rock samples, and the LK would then be cast off. After this, the LOK would fire its rocket for the return to Earth. The LK's docking port was a latticework of 96 hexagon-shaped holes arranged in an isometric grid, each as a potential docking port for the snare-shaped probe of the LOK to fit in without precise alignment of the two craft. Due to weight restrictions, the docking interface was designed to be as simple as possible, with a strictly mechanical interlock and no electrical or fluid connections. Docking and undocking were only possible a single time. 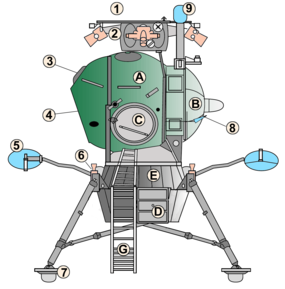 The LK spacecraft can be subdivided into the lunar landing aggregate ("Lunnyi Posadochnyi Agregat", "LPA") and the lunar ascent vehicle, ("Lunnyi Vzletnyi Apparat", "LVA'"). Propulsion, both for landing and lifting off the Moon was based on the Block E propulsion system. The Information Display System (spacecraft control panels and controls) version was called Luch. The four missions using an LK used the T2K variant, almost identical to the standard LK, but without landing gears. The LK as T2K was tested unmanned in Earth orbit four times, as Kosmos 379, Kosmos 382, Kosmos 398 and Kosmos 434. The first test was on November 24, 1970, the second on December 2, 1970, the third on February 26, 1971, and the fourth on August 12, 1971. All four LKs were launched with the Soyuz-L rocket. The first flight imitated the planned working cycle of the Blok E rocket block. The third and fourth flights were intended to test the LK's behavior under several flight anomalies. All flights went well, and the LK was considered ready for manned flight. The success of Project Apollo in putting American astronauts on the Moon in 1969 meant that the United States won the Moon race, although plans were being drawn right up until the early 1970s. Four N1 launches were attempted including two later with dummy LK but all were failures, despite engineering improvements after each failure. The second launch attempt on July 3, 1969, just 13 days prior to the launch of Apollo 11, was a catastrophic failure which destroyed both the rocket and the launch complex. Subsequently, the complete L3 lunar expedition complex with regular LK and Soyuz 7K-LOK module-spacecraft for Moon flyby and landing by full unmanned mission of future manned scenario was prepared for fifth launch of modified N1 rocket on August 1974. The N1-L3 program was cancelled in May 1974 and the Soviets decided to concentrate on the development of space stations, achieving several firsts in the process. A drawing and a CGI image of the Apollo LM and Soviet LK landers. It had no docking tunnel like the LM's; the cosmonaut would space walk from the LOK (Soyuz 7K-L3) to the LK and back. The final deceleration, from a velocity of 100 m/s at an altitude of 4 km above the lunar surface, was done with a Blok E stage, capable of multiple restarts. This allowed the same Block to also serve as the ascent stage to return the LK to lunar orbit; the LM's landing stage had a dedicated engine for landing. For better performance, LK Block E engines used turbopumps to provide them with fuel components. Solid charges were used for quick activation of the pumps that limited the number of ignitions. After landing the LK landing gear structure was designed to serve as a mini-launch complex for the upper stage's lift-off; the Apollo LM used its descent stage in the same fashion. The LK Block E had both primary and reserve engines allowing for reassurance of ascent; the Apollo LM lifted off with a single ascent engine, and had no backup or reserve but was designed for simplicity and reliability allowing for optimal assurance of ascent. A failure of the LM ascent engine would guarantee a critical mission failure. A lander at the main RKK Energia headquarters. Moscow Aviation Institute (temporarily displayed at Disneyland Paris). Orevo Research and Educational Facility of Bauman University in Dmitrov. RKK Energia plant at Korolev. A. Mozhaysky Military Space Academy in St Petersburg. Wikimedia Commons has media related to LK (spacecraft). ^ a b c "LK". Encyclopedia Astronautica. Archived from the original on 2009-04-18. Retrieved 2009-07-15. ^ Mark Franchetti (July 3, 2005). "Russia plans first men on Mars". London: The Times. Retrieved 2008-02-05. This page was last edited on 1 April 2019, at 20:23 (UTC).